Outpost Tomorrow | Tortoise & Hare wraps up 2015 with another mention! Tortoise & Hare wraps up 2015 with another mention! In Lola Pierson’s irreverent take on Chekhov, those siblings pining for Moscow became the Waiting Dead, disinterred for one more replay of their sad tale. But they were never more lively (or deadly) than in SVT’s staging. 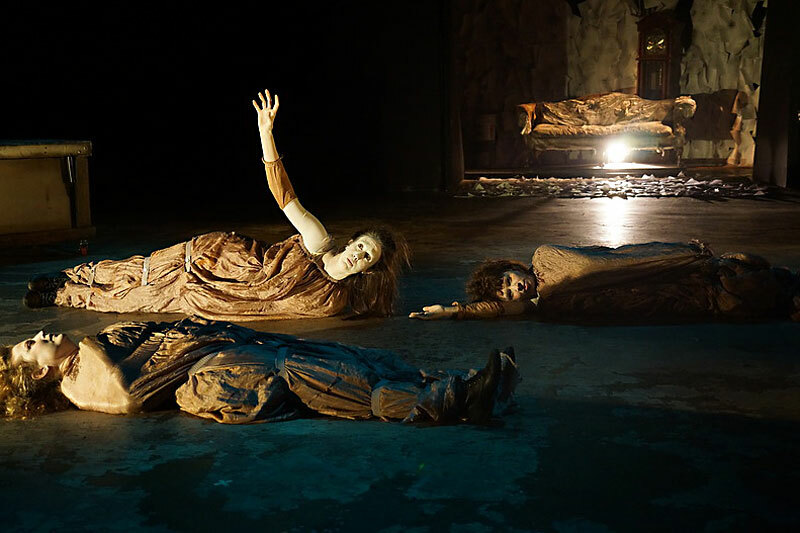 The biting script was charged with a wild theatrical energy by the rolling wall of Ia Ensterä’s set and Yury Urnov’s direction, and the performances, kicked off with sublime mime from Robert Matney, were to die for. Devised by Minneapolis-based the Moving Company with UT students, this meditation on humanity in transit gave a bracing global tour, with stops that included a Soviet train depot, a Midwestern nursing home, and a magical library. Driven by the masterful performances of the guest artists, this poignant, comic work moved and was moving. Cole Porter’s saucy showbiz riff on Taming of the Shrew became a rafter-shaking shindig in harlequin tights as ace choreographer-director Cassie Abate put her students through their paces. The cast’s handling of the script’s raucous comedy and Porter’s sly tunes delighted, as did Michael Raiford’s eye-popping designs. In their reinvention of Aesop’s fable, Allen Robertson and Damon Brown created an original musical for Summer Stock even more joyous and affecting than 2014’s Stone Soup. Lessons about friendship, community, sacrifice, gender roles, and the environment were served up with rap, catchy tunes, and the humor and heart of a Pixar film. Ebony Stewart brought all the fire and fearlessness that’s made her a legend in spoken-word circles to this solo show about her own pain and healing. As intensely personal and richly written a show as I saw, its artfully chosen words delivered with spellbinding force. Just to see gifted actors Lee Eddy, Jeffery Mills, and Michael Joplin play off one another was a joy, but to see them play strange games and lose their identities to an absent master in Hannah Kenah’s Beckettian fling was both a joy and unnerving. Just a girl alone in a basement acting out the Cinderella story, but the playing of it was pure enchantment, thanks to the charm of Rupert Reyes’ script; the clever, witty use of household objects as puppets by Caroline Reck; and the vivacity of actor Gricelda Silva, who brings to every role a magic all her own. That rare play that puts a crisis of faith center stage and treats believers with compassion, Lucas Hnath’s drama of a megachurch minister causing a seismic rift in his congregation is remarkable, and HPT staged it with a sensitivity that touched heart and spirit. For whatever bizarre impulse led playwright Mickle Maher to mash up Albert Camus and the 2004 presidential race, we’re grateful. It served up a feast of provocative political satire and, in this staging, the perverse glee of watching Robert Pierson’s spot-on W implode. Dystopian futures are yesterday’s news, but this one, in which The Simpsons goes from pop-cult touchstone to primal myth, offered a fresh view of the power of stories. Animated by a fine cast and Tara Cooper’s exquisite Simpsons masks. Nahum Tate’s notorious rewrite of the Bard (Lear ends happily!) was revived with respect by Beth Burns and a production team whose fidelity to Restoration presentation made this take on the familiar tale sumptuous and surprisingly appealing.